I'm very excited to tell you that I have one copy of the Dino Bite game to give away. If you missed it, you can check out my Review for all the ins and outs of how it works. It's a great family game that everyone will love, I know I love it. Dino Bite is brought to you by Drumond Park and costs around £19.99 but not for you, as one of you lovely, lucky people are going to win a copy for free. How fab is that! The Dino Babies are in danger from the rampaging T-Rex. Can you save them all before the DINO BITES? With realistic jungle noises and the shock of the lunging dinosaur, this is a game of spine-tingling excitement and fun for all adventurers. Each turn, players must save a Dino baby by lifting the giant leaf and sneaking out a Baby using the tweezers provided. But beware! If the T-Rex knows you're there, it roars out loud and lunges forward to scare you away from its next meal! To WIN simply enter using the RaffleCopter Form below. It may take a few seconds to load at busy times so please do be patient with it ( It will load soon) Good Luck. This competition is open to the UK only and will end on Thursday 16th July. One winner will be drawn at random from all the correctly made entries and contacted by email. I love the new pie game! The Logo game is so much fun. 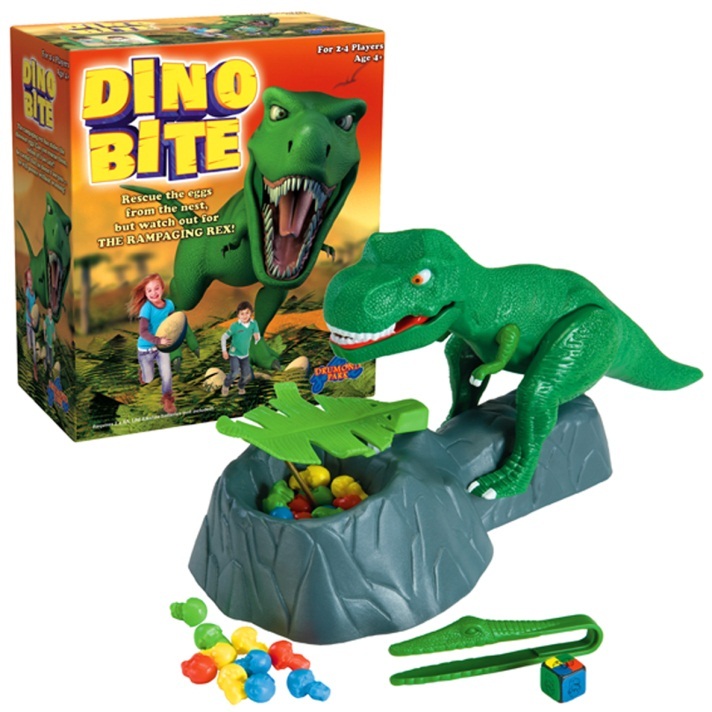 The dino bite game looks fun! The Best of British, so much to learn about our country and culture! Dino bite looks great, the kids would love it and wordsearch junior too. Has to be the bubble buster kazoo game!! It just sounds really entertaining and funny! Rapidough - messy and fun.